Local activities in the town are sustained by providing opportunities and mechanisms for everyone to participate in the city through community programs. At the same time, by planning and connecting the various programs, our goal is to create an autonomous area management system in which the local community leads the creation, maintenance and development of value in the region. A points program -- in which local points earned through participation in town activities can be reused for various local programs and events -- has been established and is currently being tested so as to promote participation and understanding in local activities and to foster human interaction through such efforts. Various programs are being planned and implemented to connect people with one another and provide an opportunity for new residents to adapt to the local community. Many new, resident-led activities that step beyond the bounds of conventional organizations have been established through these efforts. The Pinocchio Project is a program in which future leaders (=children) learn how a city works, by experiencing different jobs in an actual town. This project involves the cooperation of many local facilities as well as the participation of local children and guardians in its planning and operation. This council was established in July of 2011 by resident groups and businesses around the station as an umbrella organization for local activities. The council engages in the resolution of local issues as well as the maintenance and improvement of the living environment. UDCK plays a part in the operation of this council while supporting these local activities. 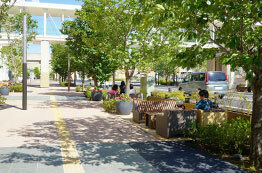 UDCK (a general incorporated association) leads the management and use of the improved street spaces around the station's west exit, based on an agreement with the City of Kashiwa. In addition to continually hosting the Marche Couleur, as a place for residents to express themselves and create liveliness in the city, the space is used to assist Kashihana activities that foster greenery in the station-front space through the work of gardening. 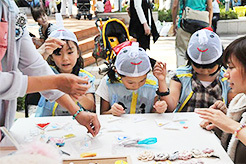 Seasonal, theme-based events are collaboratively implemented with joint publicity, such as the "cherry blossom picnic month" in the spring and the "town as a whole as an open campus" event in the fall. Information on the various local activities is spread through the use of different mediums such as the large-scale, digital, touch-panel signage in the city, print media and the web. K Salon is a gathering hosted by UDCK. It is an event for casually discussing the future of community building (with a drink in one hand) based on topics introduced by special guests involved in community building.